Harve Bennett: Steve Austin, astronaut. A man barely alive. Oscar Goldman: Gentlemen, we can rebuild him. We have the technology. 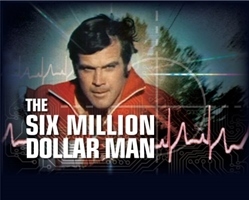 We have the capability to make the world’s first bionic man. Steve Austin will be that man. Better than he was before. Better… stronger… faster. 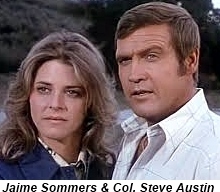 Col. Steve Austin (Lee Majors) astronaut and test pilot is injured in a crash. 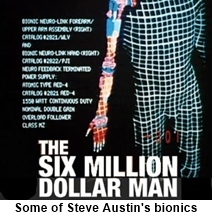 The government is hot to try out some new bionics so they use Austin as they’re test dummy (not exactly the way it’s portrayed in the show but you get the idea). This miracle is performed by Dr. Rudy Wells (Martin E. Brooks) under the supervision of the government liaison Oscar Goldman (Richard Anderson) at a price tag of… oh shucks you guessed it. Austin receives bionic legs, a right arm and one eye. Goldman works for the OSI (Office of Scientific Intelligence) and not wanting to waste their investment they encourage the now greatly improved Austin to come work for them as an agent. This job gets Austin into dangerous situations that require his bionics to get out of safely. Before the weekly series there were three made for TV movies which were so popular that it prompted ABC to do the series. There were also three additional TV movies starting in 1987 ten years after the series was canceled. In 1976 the character Jamie Sommers (Lindsay Wagner) who was Steve Austin’s girlfriend was given the spin-off series The Bionic Woman. Both Richard Anderson and Martin E. Brooks appeared as the same characters on both shows. The next season however Bionic Woman was canceled by ABC and picked up by NBC creating the first ever character sharing agreement between two competing networks.